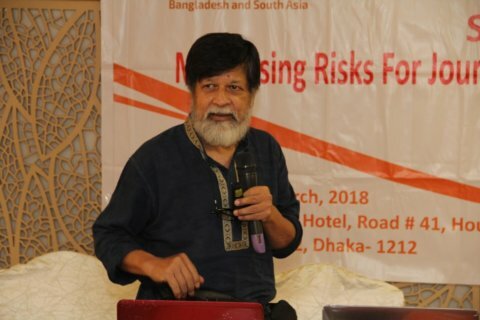 On 5 August 2018, the award winning photographer and founder of DRIK Gallery, Shahidul Alam, was arrested at his home for allegedly giving false information to different media and making “provocative comments”. His arrest took place hours after he posted a video of the ongoing road safety protests in Dhaka on Facebook and participated in an interview for Aljazeera about the protests. ARTICLE 19 calls for Alam and other individuals detained for participating in protests and practicing journalism to be immediately released. We also call for protection of media workers, journalists and citizens peacefully participating in protests. Yesterday morning, Shahidul’s partner Ms. Rahnuma Ahmed informed the media and public at a press conference held at DRIK Pathshala (Photography School) that Shahidul was forcibly taken away from his home a little after 10.30 pm on Sunday by a group of 20-25 men in plain clothes. They taped up the CCTV Camera and took away the camera footage. Yesterday the Dhaka Metropolitan Magistrate Court ruled for Alam to remain in police custody for seven days for alleged violations under section 57 of the Information Communications Technology (ICT) Act 2006. When brought before the court, Alam reportedly said he had been beaten while in custody. 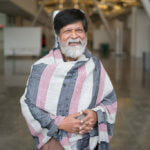 On 7 August Alam’s lawyers filed a petition before the High Court Division of the Supreme Court of Bangladesh to produce him before the court. ARTICLE 19 and other free expression advocates have consistently raised concerns that Bangladesh’s ICT Act, 2006 (as amended in 2013) is incompatible with international standards on freedom of expression, and called for its urgent repeal. Section 57 in particular provides the authorities with broad powers to restrict online expression, and has been widely applied against journalists and ordinary citizens, who have been arrested without a warrant, prosecuted and jailed solely for their expression. Despite repeated high-level commitments to repeal section 57 of the ICT Act, including most recently during its May 2018 review under the Universal Periodic Review mechanism of the UN Human Rights Council, it continues to be used to silence journalists, media workers and activists. More than 40 journalists and media workers, including four women journalists, were injured over the weekend by armed men during the road safety protests in Dhaka. The demonstrations that began after a speeding bus killed two teenagers on 29 July were in their ninth day when peaceful demonstrators were reportedly set upon. Among the injured included reporters and media workers from a range of media houses including the Daily Star, Prothom Alo, Kaler Kantha, JanaKantha, Ittefaq, New Age, NTV, Channel 24, Channel I, Nagorik TV, BDNews 24.com and Sharabangla.net. Daily Star journalists included Shaer Reaz, Salim Sadman Somoy, Sushmitha Preetha and Rafiqul Islam. Among others injured were Ahmed Deepto, Sajid Hossain of Prothom Alo, Nishok Tariq Aziz of Kaler Kontho, Mahmuduzzaman Ovi of BDNews 24.com and AM Ahad of Associated Press who received serious head injuries. 22 of the injured were photojournalists. Speaking to ARTICLE 19, Sushmita Preetha described being assaulted as she tried to film the demonstration; ‘I was on the footbridge watching the procession pass by with demonstrators chanting “Joy Bangla”, however as soon as I started to film the procession a group of them [armed men] climbed up the stairs of the footbridge shouting “catch her”.’ Preetha was held by force against the footbridge until she agreed to delete the footage, however before releasing her, “amid the chaos, they groped and touched me hurling abuses”. Journalism associations across the board have condemned these violations against journalists and media workers including the Editors Council, Nari Sangbadik Kendra, Bangladesh Photo Journalists Association and Dhaka Reporters Unity. Speaking to ARTICLE 19 Sohel Haider Chowdhury, the General Secretary of the Dhaka Union of Journalists said: “These attacks on journalists and media workers are an attack on democratic values, we demand that those responsible for such violations regardless of their political affiliations be brought to account immediately and without delay”. Unconditionally and immediately release Shahidul Alam and drop all charges against him. Ensure the safety, security and protection of journalists, media workers, human rights defenders and citizens participating peacefully in protests. Ensure that those responsible for attacks and violations on journalists and media workers regardless of their political affiliations be brought to account immediately and without delay. Bring all its legislation into conformity with international human rights standards by repealing or amending legislation that restricts the exercise of the rights to freedom of expression, peaceful assembly, and association, including in particular the ICT Act and the proposed Digital Security Act. Demonstrate its commitment towards promoting and protecting freedom of expression by accepting all related recommendations at the adoption of its UPR, during the 39th session of Human Rights Council, and commit to working with civil society towards their full and effective implementation.